A: This question comes up a lot for families. It is indeed very common for older adults to experience unintentional weight loss at some point in late-life. For doctors, unintended weight loss is a major red flag when it comes to the health of an older person. So in geriatrics, we usually recommend that an older person — or their caregivers — monitor weight regularly. This enables us to spot weight loss sooner rather than later. In this post, I’ll go over each of these steps in more detail. This often goes hand-in-hand with malnutrition in aging. Now, they aren’t quite the same thing: it’s possible to be malnourished without obviously losing weight. But they tend to go together. 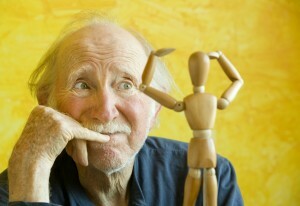 Both problems are common in older adults. One study found that 39% of hospitalized older adults were malnourished. This is a terrific quick-and-easy way to monitor overall health and nutrition in an older adult. To track the weight of an older person who lives at home or in assisted-living, I usually recommend checking and recording the weight at least once a month. Once you start tracking weight: at what point should you be concerned? A general rule of thumb is that unintentionally losing 5% of one’s original body weight over 3-6 months is cause for concern. But it’s also reasonable to be worried if you notice a steady downward trend. Once you’ve become concerned and documented a change in weight, you’ll want to bring it up with a doctor or other health professional. Monitoring for unintended weight loss, as detailed above, is probably the easiest way to screen for nutrition problems. Decreased strength and/or ability to get around. Note: The term “nutrition” can be used differently in different contexts. In geriatrics, the focus is often first on ensuring that an older person is getting enough calories and protein to maintain energy needs and muscle mass. Obviously, there is more to nutrition than just this; it’s also important that people meet their body’s needs for vitamins and minerals, and that they eat a “healthy diet.” Exact definitions of a “healthy diet” differ, but it’s generally one that promotes health and well-being, and doesn’t cause or aggravate health problems. A Mediterranean-style diet can work well for many people. It’s important for an older person to get a clinical evaluation, once you’ve noticed weight loss or other signs of possible malnutrition. A simple initial assessment tool that many clinics will use is the Mini Nutritional Assessment. Difficulty leaving the house to purchase food. This can be due to limited mobility (e.g. due to pain, fear of falling, etc), lack of transportation, or cognitive problems. Difficulty or pain with chewing and swallowing. Many seniors fall behind on dental care for various reasons. This can lead to painful mouth conditions, or a lack of suitable dentures. The main way to help doctors is two-fold. One is to bring in a weight record, showing how the older person’s weight has changed over the past several months. The other is to bring in information related to symptoms and ability to obtain food. You can do this by asking your older relative — and anyone else who is familiar with the person’s daily life — the interview questions listed above. Of course, the doctor will still need to ask these questions, but it’s extremely helpful for patients and families to have thought through the questions ahead of time. You can also download and complete the “Self-MNA” (self Mini-Nutritional Assessment) and bring it in to discuss with your health providers. Unfortunately, it’s common for many doctors to quickly turn to prescribing high-calorie supplements like Ensure, or even prescription appetite stimulants. Avoid using prescription appetite stimulants or high-calorie supplements for treatment of anorexia (loss of appetite) or cachexia (loss of muscle mass) in older adults. Instead, optimize social supports, discontinue medications that may interfere with eating, provide appealing food and feeding assistance, and clarify patient goals and expectations. Now, even when social issues and medical problems are addressed, it’s often necessary to provide some extra nutritional support to those older adults who have been losing weight. This usually means providing extra protein and extra calories. Fat is dense in calories, so this can be a good way to increase energy intake. Technically it’s better to provide “good fat” like olive oil, but in the short-term, I encourage people to consider whatever fatty foods the older person really likes to eat, which might mean ice-cream or peanut butter. Research also suggests that many older adults may benefit from supplemental protein, especially if they’ve been showing signs of lean muscle loss. Many studies have used milk or whey protein. So should you consider Ensure or Boost? You should discuss more with your father’s doctor, but my take is that such commercial supplements should be used only as a last resort. They are expensive, usually contain a lot of sugar, and contain various additives. So it’s better to make your own smoothies or otherwise provide nutrient-dense snacks and protein to your father, if at all possible. I’ve provided a lot of information while answering your question, so let me summarize the most important take-aways. Tracking monthly weights is a good way to keep an eye on the health of an older adult. Put it on the calendar. A “connected” scale can make it easier to log and share the weight record. Unintended weight loss is a major red flag. Take action and consult a doctor if an older person loses 5% of more of their body weight, or if you’re otherwise concerned. Be sure to check for problems related to purchasing, preparing, and eating food. These are easily overlooked in older adults. They may be related to mobility difficulties, cognitive impairments, dental problems, depression, or unappetizing diets. Commercial supplements and/or appetite stimulants should be used only after careful consideration with the doctor, and after considering alternatives. They often feel like the “easiest” solution (assuming one can afford them) but they’re usually not the best way to maintain an older person’s nutrition and well-being. Have you been concerned about an older person’s weight loss? Post your questions and comments below. The post Q&A: What to Do About Unintentional Weight Loss appeared first on Better Health While Aging.